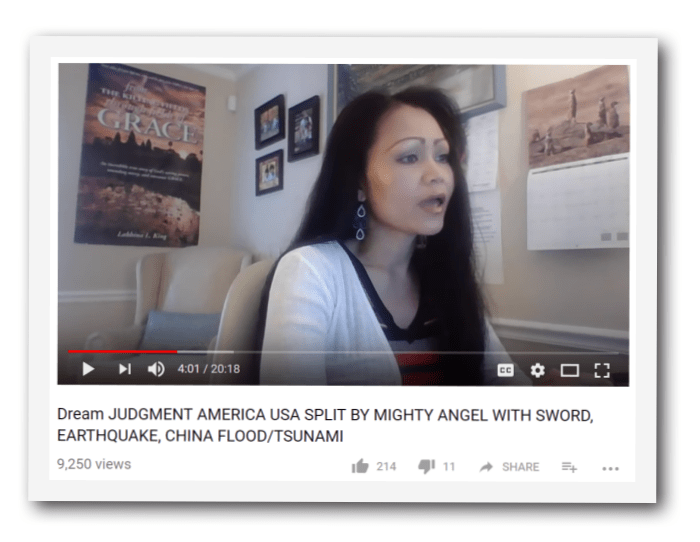 “In in my dream from October 29th 2017 of this year I heard clearly while in a deep sleep that one third of China will be destroyed by I think mega typhoon or tsunami. I’m not sure on that but I heard clearly one-third China will be destroyed. In the same dream I also heard America will have destruction from coast to coast right across the land in my dream. I saw America North America divided into two starting from the west coast towards the east coast (east towards the west). The word that I heard spoken in this dream that described – a type of destruction was coming began with the word sea SCA like the sea like the ocean something like sea warfare or Sea Gate warfare. I’ve never heard of those words before together so I don’t know it was something close to that. I cannot remember exactly the word given but I know that it began with the word sea EA keep that in mind. It’s coming from the ocean from the sea the destruction and that it will be a war of some sort. So destruction will come from the sea perhaps tsunami or the enemy attacking from the sea I do not know but destruction was coming to America was what I heard and saw clearly. Then I saw a huge strong massive being a super sized being he was an angel of the Lord at first I wasn’t sure what this massive strong muscular represented but I had a feeling that he was one of God’s mighty angels. I prayed much to the Lord to reveal who this being was. God’s Word says if we lack wisdom ask knock and seek so I did. James 1:5 says if anyone of you lack wisdom let him ask of God that giveth to all men liberally and upbraideth not and it shall be given him. So after praying and asking seeking and knocking for the Holy Spirit to reveal to me this is what he’s put in my spirit late that night and the next morning. So over 24 hours of continual seeking studying scriptures and praying and counseling with other spirit fill sisters in Christ that I trust the Lord instructed my heart to search the Word of God for angels that stood on land with a sword. Now that’s from the Holy Ghost. Nobody told me to do that but the Holy Spirit. In my dream this huge strong super being looked like a man that stood high between the earth and the skies with a big sword type instrument he stood on North America. This mighty angel was seemingly half the size of North America. He was huge. He was massive and tall lean and muscular not an ounce of fat or fluffiness anywhere on his muscular arms and chest. His hair was like bronze and blondish color mix. He was all man strong and powerful. He stood around the upper middle West Coast part like around the New York, Pennsylvania, Maryland part of this the North America continent and with his sword. He struck the earth with a mighty force. He was strong, he struck the earth with his sword and the earth opened up and it split from the west coast towards the East Coast it just split into two. I did not see it going all the way to the East Coast because I woke up but as he struck the earth and the earth split he said with a loud powerful voice America would be destroyed or attacked by something that began with the word CSEA. I saw the word written out in my dreams but did not know what it was I had never seen that word together before. I tried to remember the very words written out in its fullness but all I remember for certain is that it began with C s-e-c warfare seagate warfare??? being in this dream was God’s mighty angel but I did not see wings. So in my prayer times I was instructed in my spirit to research scriptures of God’s angels standing on earth with a sword and based on these verses I believe that God is calling me and all of you my brothers and sisters in Christ believers in the Lord Bride of Christ he’s calling us to intercede with the love of Christ for both America and China. 17:17 in the video he talks about this channel of water running through along where the Mississippi is. It became wider and wider, and cut a channel that became wider across, about 200 miles. Can You CURSE Yourself By Your Hatred Of Israel? – Why God? Were The Prophets Wrong Or Was A DISASTER PAUSE Button Hit In ..
“Open war is coming against Israel” A Word for Rosh HaShannah . Rebecca N Barnes’s Vision Of An Asteroid Hitting France – Why God? What Will Happen If We Divide The Land Of Israel? Why “Land For Peace” In Israel Isn’t The Answer – Why God? Could We Be Seeing Warning Signs Of Israel Being Divided Soon? How Believers Of Yeshua Jesus Will Return To ISRAEL – Why God? Major Earthquake Warning Along The New Madrid Fault – Why God? Pipe Lines Over The Madrid Area – Why God?